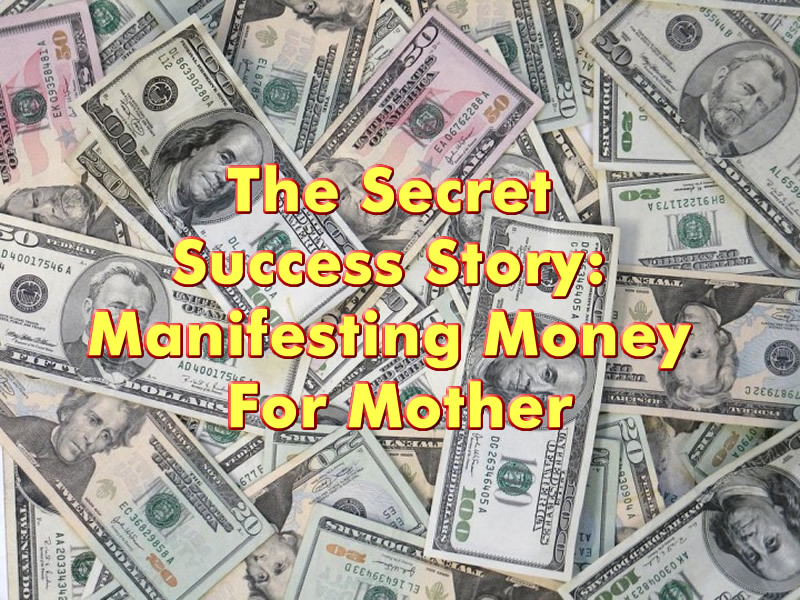 Today’s story shows how the author used the secret and the law of attraction to manifest money for her mother. Bed time; not the first place a kid wants to go at the end of their day. Except for me of course! I always loved getting into bed at night before my mom because I shared a room with her and she always got the top bunk so I knew I needed to fall asleep first and fast to get a good sleep. So I truly enjoyed the scheduled time for bed. This bedtime schedule offered me just enough time to “day dream” about my goals. Now, for a kid, this is a little bit strange looking back, however, I’m grateful I did it because the things I manifested from this were amazing! I always thought about what grade I wanted on a project, what I wanted for dinner that week, what I expected for free that week and what specific thing I wanted at that time. Well this grew and grew as I grew older. By the time I was about 15 or 16 I had practiced my “magic powers” so often that I knew I could get what I wanted. Mind you at this time in my life I had never heard of The Secret or the law of attraction. I just knew what kind of powers I had, myself. I over heard my mom talking to my grandmother, who we lived with. She talked about being so mentally exhausted and upset because every single time she had saved up enough money to put a down payment on a home of her own, something always came up. If it wasn’t my little brother setting his mattress on fire by accident, it was myself needing money for a sports trip for school, or something broke on the car, etc. I had never really told my mom about my “powers”. I really didn’t think she had time to hear it at this point in her life so I mostly just kept it to myself. But when I heard what she needed I jumped on that! I knew in my heart that I could fix her problem. I had no idea how nor did I care how, I just knew I would. That night I set intentions when I went to bed. I started saying all the things about the bedroom I was in that I was so grateful for and it set my imagination on fire! The next night I did it again but then I also added what I would be so happy to have more of them. The night after that I did it again and then I demanded to the Universe or “my magical powers” to “bring my mom the exact amount of money that she needed to make a down payment on the home that she wanted”. I went on to explain all of the reasons why she deserved this money. My emotions were high! I truly felt inside of me the gratitude I had for my mom and everything she had sacrificed to take care of my brothers and I. After a few nights and maybe a week later, I had already forgot about my demand and each night I would go back to what I wanted. One day, my mom was at the computer desk in the living room doing her thing and I was in our bedroom working on homework. I heard “Shealee” in the most fearful voice I’ve ever heard from my mom. I instantly ran to the living room to see if she was OK. I saw her sitting in the computer chair, one hand on her heart, glasses on her face and another hand holding her lottery ticket. She always bought lottery tickets with no intention of winning but knowing that it could be her small weekly donation to the charity that the tickets share money with. I asked if she was alright and she said “Baby I need you to look at this and tell me if these numbers match.”. So I did, and they did! Now, I had no idea how numbers and tickets worked but from the expression on her face I knew it was a good thing. She took me with her to the store down the road where she had bought the ticket. With tears in her eyes she showed the lady and she literally looked at me and said “Shea, this is $6000. This is exactly what I needed to get money for our own home. This is all I need to give you your own bedroom!” My mouth dropped and all I could think to myself was, how the heck did I do that? She didn’t even care that she was just one number away from being a millionaire, she was just so genuinely happy that she got all that she needed. After that day I just said thank you a million times a day for at least a week, for everything. I was so happy to have had the ability to give my mom what she needed and to make her happy. That was literally my life goal. For such a kind and generous person she deserves the world. To this day she still doesn’t know it was me! Maybe this will be published so she knows! Tammy Johnson, you are an amazing person and I hope that I can be half the person you are one day. About the Author: I am a post secondary grad working in the field of social work with the dream to be a motivational teacher/instructor to guide youth to the power that they posses and don’t know about. I love snowboarding and hope to be able to bring people who struggle with mental health to a point where they can use the power of The Secret and fitness to save their lives themselves.